Add some intrigue with an Earl Grey infused cranberry sauce this Thanksgiving. Thanksgiving is just around the corner, so it is time to start planning what is considered one of most important meals in America. For tea lovers, it is a chance to use our favorite beverage in several dishes to highlight how it adds depth and flavor you will not find with other ingredients. For me, freshly made cranberry sauce is a requirement. It probably has more to do with the fact that it is the key ingredient in my favorite coffee cake from childhood than anything else, but it also brightens up the presentation of the other food, like turkey. So let’s jump right into making one of the easiest side dishes in the Thanksgiving meal. Cooking this recipe only takes about 15 minutes and requires you to be focused on the sauce in the pot, so you will notice a lot of these steps are focused on preparing to cook. Skip them at your own risk. Empty the package of cranberries into the colander and rinse under water. Now is your one chance to sort through them, remove any stems that may still be there, and remove any bad cranberries. Bad cranberries are cranberries that are soft and wrinkled or have soft spots on them. You do not want these in your sauce as they will ruin the flavor and can make you sick. Once you have sorted your cranberries, pour them in the pot and add sugar and put the pot on the stove. DO NOT turn on the burner yet. Start your kettle for the water for tea. While the kettle is heating up you can put your tea in the glass measuring cup and get out the container, long handled spoon, spatula, timer and oven mitts and put them by the stove where you can get to them quickly. Add the boiling water to the tea and steep for 5 minutes. Remember you only need 1 cup of water. When the 5 minutes are up, pour the water through the strainer straight into the pot with the cranberries and water. Turn on the burner now to high and use your long handled spoon to stir in any sugar that did not get into the tea. Set your timer to 10 minutes and put on your oven mitts to protect your arms from splash back from the popping cranberries. Once you hear your first cranberry pop, start the timer and start stirring. The goal is to allow the sauce to come up to a rolling boil while you are stirring. Once you have that boil, drop the heat down to medium and keep stirring. You are only stirring for 10 minutes and it does not need to be a vigorous stir. Just keep the cranberries and liquid moving. 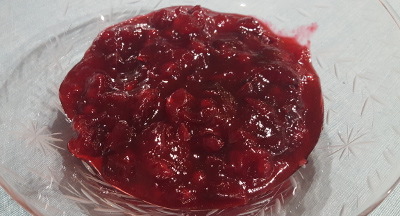 If you want more of jelly consistency to your sauce, squash the popped cranberries with back of your spoon against the side of the pan as you stir. If you like whole cranberry sauce, just stir. When the timer is up, turn off the burner and take the pan off the heat. This is when,if you want, you will add the orange zest by running the micro-planer lightly over the outside of the orange. The goal is to get as much of the orange skin without the white pith underneath. You are looking for a tsp, which is find is about 3-4 passes over the orange based on its size. I just zest over the sauce and stir. Pour the sauce into your storage container and leave the lid off to allow the sauce to come down to room temperature. Once at room temperature, put the lid on and put it into the refrigerator. If you do not have time for this, you can put on the lid and put it into the refrigerator, just realize that condensation will form on the inside of the container which may cause your sauce to be more runny than you want. When the sauce cools down (it will take a few hours), have a taste. The bergamot oil will be present, but not overwhelming. It makes for a nice change to traditional dish. Want to go all out this Thanksgiving with tea infusions? Check out Irish Soda Bread, Matcha Salad Dressing, and Matcha Green Tea Ice Cream for dessert! This entry was posted in Cooking with Tea and tagged Cooking with Tea, Earl Grey. Bookmark the permalink.